Create a rocket in space using lines and shapes. Add details and color. 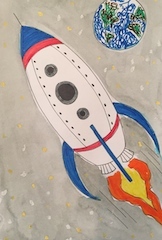 **Extend the lesson by creating a new rocket/spacecraft each day for five days!